Last year I began writing for a relatively new Canadian photography magazine called Photosho. The magazine is published twice per year in October and April and offers Canadians the opportunity to showcase their photography. My column, entitled “Click On – Web Resources for Photographers”, covers a wide variety of online resources of interest to photographers including podcasts, blogs, wikis, websites and even social networks with a focus on photography. Issue #5 came out a few weeks ago and this issue is devoted to Black and White Photography. One of the masters of B&W photography is Ansel Adams and you can learn more about his and his life’s work by visiting his website at www.anseladams.com. In the more modern era of photography, the work of war photographer James Nachtwey has brought attention to the plight and suffering of people around the world whose lives have been torn apart by war, poverty, and disease for close to 30 years. In 2007, Natchtwey was awarded the TED Prize and used the $100,000 to fund a campaign to raise awareness of Extreme Drug Resistance Tuberculosis (XTRB). The collection of his black and white photographs from around the world can be found at http://www.xdrtb.org/photographs.php and are an excellent example of the importance in recording history and raising social awareness through photography. 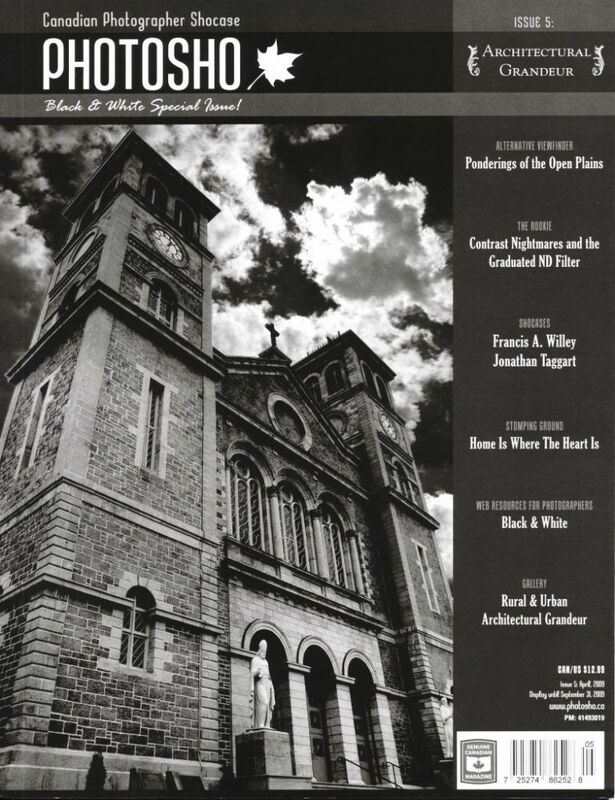 This issue also features some stunning photography of rural and urban achitecture done in B&W. If you are looking to support a fantastic Canadian publication, I would encourage you to check it out at www.photosho.ca and if you like what you see, please subscribe to the magazine. The magazine is also available at your local Chapters. Be sure to leave a comment if you run across the magazine anywhere else or if you have had a chance to read it. I’d love to hear your feedback. Also if you know of any additional photography magazines that you think I should be reading, please leave your comments on the blog. I appreciate greatly the feature in this marvelous Canadian magazine. The first time I had my image ‘Blindness’ published in Canada. Thank you kindly.